An unexpected partnership was forged last week at India’s defence exhibition, DefExpo 2018, in Chennai. For some time, India has been in negotiations with Japan to purchase more than a dozen US-2 amphibious aircraft for the Indian Navy and Coast Guard. 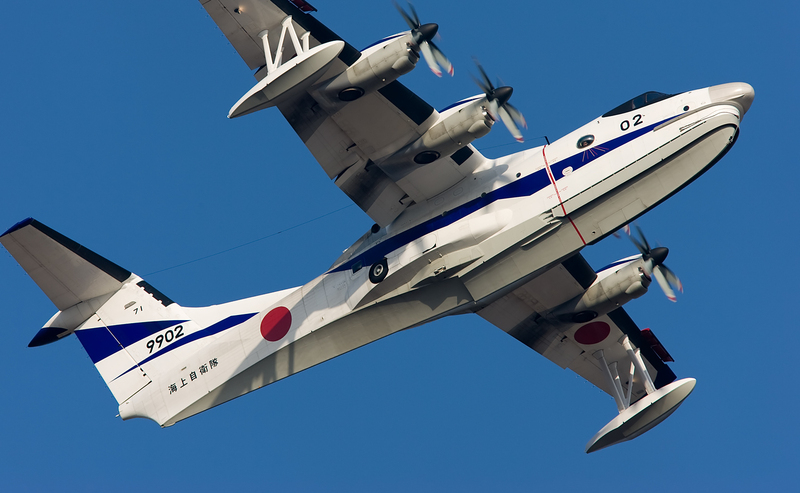 Considered the world’s best amphibious aircraft for short take-off and landing, with a range of up to 4500 kilometres, these flying boats are used for surveillance by the Japanese Maritime Self-Defence Force. Yet the deal did not make much progress due to high costs and, more importantly, Japan’s reluctance to transfer technology and agree to India’s insistence on joint production. At the 2017 Japan–India annual leadership summit in India, it appeared the deal would be announced, but it remained elusive. Then came last week’s surprise announcement. Japanese aircraft giant ShinMaywa, manufacturer of the US-2, and India’s Mahindra Group signed a Memorandum of Understanding to set up maintenance, repair, and overhaul of services in India, as well manufacturing and assembly of structural parts and components the aircraft. While the deal is between two commercial companies, collaboration in defence-related fields, especially joint production, requires government blessing. The deal is a result of long and persistent negotiation between the two sides, and opens a new chapter in India–Japan relations. It also allows Japan to venture into defence collaboration outside existing frameworks with the US. Japan removed its decades-long self-imposed ban on arms exports in 2014. The India–Japan partnership in defence manufacturing feeds into Indian Prime Minister Narendra Modi’s “make in India” campaign and Japanese Prime Minister Shinzo Abe’s “free and open Indo-Pacific”, in which Tokyo considers New Delhi a crucial strategic link. The speed at which India and Japan have developed their relationship, especially in security and defence matters, is remarkable. Throughout most of the post-war era, their relationship was largely marked by caution, even suspicion, and low-key engagement. Only a couple of decades ago, Tokyo harshly condemned New Delhi for its nuclear acts and imposed economic sanctions culminating in the lowest point in the bilateral relationship. The storm passed, however, as the regional and global geostrategic environment changed. Since Abe visited New Delhi in 2007 to speak at the Indian parliament, the bilateral relationship has moved from strength to strength. Japan and India have declared themselves “special strategic and global partners”. Japan signed a security declaration agreement with India in 2008, only the second of its kind, outside the Japan–US security treaty, after the security declaration agreement made with Australia in 2007. The relationship gained further momentum when Abe returned to power in 2012 and Modi became India’s prime minister in 2014. The Abe–Modi chemistry has been remarkable among world leaders in recent times. There are many reasons for the two countries to become closer. India’s growing economy offers incentives for a stagnating Japan to pursue new business opportunities. The improved India–US relationship is another reason for Japan to forge ties with India with more confidence than before. But above all it is China that has brought the two countries closer together. Both nations harbour great concerns about China’s military design and Beijing’s ambitions of great-power status while it remains a communist state. It is not surprising that Japan has made huge adjustments in policy orientations towards India. The civilian nuclear deal signed between the two nations in 2016 is only one example. It is remarkable that Japan, having acted as a global spokesperson to condemn India’s nuclear tests, has now signed an agreement with India, a country that remains outside of the Non-Proliferation Treaty framework. Japan is heavily involved in India’s infrastructure development projects. More than US$10 billion in Japanese aid – the largest sum Tokyo has ever invested in a single project through its foreign aid program – has been committed to build the first high-speed railway in India. For its part, India is giving Japan exclusive access to its sensitive northeast region and to the Andaman Islands for the development of infrastructure facilities. The defence production collaboration through the newly signed MOU between Japanese and Indian companies takes the relationship to a new height no strategist or commentator thought possible even at the turn of the century.